Въздушен балон за развлекателни полети Ultra Magic N-425 с регистрационен номер SU-283 на компанията Sky Cruise - Egyptian Airship & Balloon Co се възпламени при опит за принудително приземяване и погуби 19 туристи, граждани на Франция, Великобритания, Япония и Хонг-Конг. Британецът Рене (с леки наранявания) и египетският пилот Момин Мурад (в тежко състояние със 70% изгаряния) скочили от балона, когато почти се приземил, но след това оставен без контрол бързо набрал височина и останалите туристи попаднали в капана на вихрените пламъци и гравитацията. Сред загиналите е и съпругата на спасилия се британец. Два человека выжили при падении воздушного шара в египетском Луксоре во вторник. Шар загорелся после взрыва газа на высоте около 300 метров и упал на землю. Погибли 19 человек. Выжили один англичанин и пилот, они были доставлены в местную больницу. У пилота серезные ранения. Сопруга выжившего туриста была на воздушном шаре и погибла. На воздушном шаре находились 21 турист из разных стран, в том числе четверо выходцев из Гонконга, два англичанина, два бельгийца, один палестинец и один египтянин. Погибли, в частности, туристы из Франции, Великобритании, Японии и Гонконга. Россиян на воздушном шаре не было. A tourist balloon, Ultra Magic N-425, made in Spain and operated by Sky Cruise - Egyptian Airship & Balloon Co, was flying on a sightseeing flight over Luxor in Egypt when suddenly caught fire and crashed. 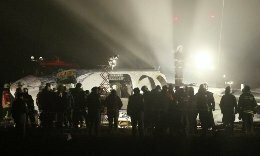 It caught fire during final approach which resulted in 18 fatalities from different nationalities (Britain, Hong Kong, Japan, Belgium, Hungary and France) and 2 injured passengers in addition to the pilot who jumped from the Balloon. One British passenger died later at Luxor Hospital of his injuries. Rennie and the Egyptian pilot, Momin Murad, managed to escape the balloon's gondola when it was still relatively close to the ground. The balloon then rose back up some 300 meters (1,000 feet) into the air. The fire spread to the balloon itself, which burst, sending it plummeting into a sugar cane field. 01.02.2013*/US/ NM/ Belen/ Alexander Municipal Airport (E80) - The owner of Cessna 182P Skylane (N182NL) was repairing the propeller when the plane rolled 100 yards from the T-hanger and ultimately struck the fire station. The aircraft sustained considerable damage. */US/ TX/ NE of Gillett - A Robinson R22 Beta helicopter (N3059Q) crashed injuring both occupants. */Italy/ Settebagni - A training Cessna FRA150L plane (I-MATU) made a forced landing on an agricultural field and flipped over. */US/ TX/ College Station/ Easterwood Field Airport (KCLL) - A Cirrus SR22 plane (N247RB) collided in midair with a Cessna 152 (N93124) sustaining substantial damage to the side door and windscreen. The plane landed safely. The sole pilot onboard the aircraft received minor injuries. 02.02.2013*/US/ UT/ Wellsville - A Cessna 175B Skylark plane (N8125T) lost engine power and force landed in a field, damaged. The pilot received minor injuries. */South Africa/ Mpumalanga/ Witbank - A Jabiru SPT plane (ZU-CRV) expeirenced an engine failure, hit power lines and crashed injuring critcally the pilot. */Carpatair ATR-72 passenger plane (YR-ATS), operated for Alitalia, was involved in a landing accident at Roma-Fiumicino Airport (FCO), Italy. The airplane landed in strong cross wind conditions and came to rest in the grass off the side of the runway. The right hand main gear had collapsed and the airplane sustained damage to the fuselage and nr. 2 engine propeller blades. Six passengers were injured, two of them seriously. */US/ FL/ Groveland/ Sheets Airport (FA42) - A hang-glider crashed killing the pilot. */US/ ID/ Boise Air Terminal (BOI/KBOI) - A light plane trying to land in heavy fog missed the runway and it was damaged. No injuries. 03.02.2013*/Brazil/ SP/ Candido Mota - A Beechcraft C90B King Air plane (PP-AJV) crashed in a field killing the 5 occupants. */US/ UT/ Salt Lake City International Airport - A service truck collided with the wing of a parked cargo jet. The wing of the plane went through the windshield of the truck injuring the driver. */Syria/ Raqqa countryside - Syrian Air Force Mi-8 helicopter shot down by rebels. 04.02.2013*/Syria/ Deir Ezzor Military Airport - The Free Syrian Army (FSA) claims to have damaged a cargo plane which was transporting weapons and ammunitions. */Israel/ Sharon region - A small plane made an emergency landng. The aircraft was damaged. 06.02.2013*/Brazil/ SP/ Porto Feliz - A Beech 58 Baron plane (PR-JHM) was located in a cane field. The aircraft, believed to have been involved in a drug trafficking operation. */UK/ Christchurch/ Hurn/ Bournemouth Airport (EGHH) - A Beech 76 Duchess plane (G-GDMW) suffered a nose-gear collapse during the takeoff roll. */Tunisia/ Tunis-Carthage Airport (TUN) - Tunis Air Airbus A320-211 plane (TS-IMB) collapsed the nose gear on landing. The aircraft sustained substantial damage. */Pakistan/ Kamra Air Base - PAF Saab Aerospace 2000AEW&C (AWACS) plane was destroyed by terrorists. Ten attackers were killed. 07.02.2013*/Malaysia/ Malacca/ Cheng Heights - A training Piper PA-28-161 Cadet plane (9M-SKZ) crash landed in front of an appartment block.due to an engine problem. No injuries. */Ukraine/ Zhytomyr region/ Knyazhin - An Antonov 2R plane struck snowy terrain during a flight from Rivne International Airport (RWN) to Poltava Airport (PLV), Ukraine. The right hand wings collapsed and the airplane sustained substantial structural damage to the fuselage. The pilot was injured. */Afghanistan/ Kapisa province/ Tagab district/ Gabri area - ISAF helicopter crashed while making an emergency landing due to technical issues. */Australia/ TAS/ Molesworth - TFS firefighting Eurocopter AS 350B2 A Star (VH-EWM) crashed injuring the pilot. 08.02.2013*/Australia/ QLD/ Texas/ Inglewood Texas Road - An ultralight plane crashed killing the pilot. 10.02.2013*/Netherlands/ Rotterdam/ The Hague Airport (EHRD) - A Mooney M20J/205 MSE plane (D-EKSS) collapsed right hand main gear on landing. No injuries. 11.02.2013*/US/ NM/ Los Alamos/ Jemez Mountains - A Bell 206B Jet Ranger helicopter (N360AW) experienced engine trouble and rolled onto it's side while landing. The helicopter sustained substantial damage and the 3 occupants on board received minor injuries. */Oman/ Muscat-Seeb Airport (MCT) - PIA Boeing 737-33A passenjer jet (AP-BEH) sustained damage in a landing accident. The airplane came to rest on the left side of the runway with the nr.1 engine contacting the runway surface. No injuries. 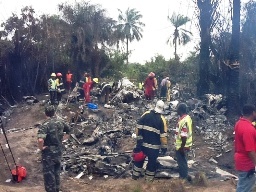 A CASA CN-235 transport plane (3X-GGG) was destroyed when it crashed on approach near Charlesville, Liberia. All 11 occupants were killed. The head of Guinea's armed forces, Gen Souleymane Kelefa Diallo, was on board the plane. He was leading Guinea's delegation to mark Liberia's annual Armed Forces Day.The flight originated from Conakry, Guinea and at 0709 GMT, air traffic control cleared the flight to land at ROB. Those who died in the crash according to security sources include, Col. Mamadou Cellou Dalein Diallo; Col. Sanousay Camara; Lt. Col. Moustaphy Sangare, Lt. Col. Soriba Diawara and Lt. Col. Mohamed Coumbassa. Others include, GDD Souleymane Kelefa Diallo, Mamadou Conde Interp, Cdt Mdou Malal Diallo, a journalist for the Guinean military, Cdt Abdourahman Camara and Mamoudou Conde Aide Camp. The black box and the digital voice recorder of the plane were found. Canada's government agreed to take them for examination. 12.02.2013*/Turkey/ Mersin province/ Tarsus district/ Camilimanda - A training Cessna 172S Skyhawk SP plane (TC-CDA) crashed killing 1, injuring 1 occupant. */US/ CA/ Colusa County/ Williams - A Lancair 360 plane (N123ST) crashed injuring the 2 occupants. */Bangladesh/ Rupganj upazila/ Nimertek - A McDonnell Douglas MD600N helicopter (S2-AFZ) crashed injuring the 7 occupants. */India/ Rajasthan’s Barmer district/ Allawani Ki Dhani - Indian Air Force (IAF) MiG-27 jet crashed injuring 2 civilians (a woman and 3-year-old boy) on the ground. The pilot ejected safely. */US/ MI/ Jenison/ Riverview Airport (08C) - A Cessna 172M Skyhawk plane (N12989) encountered ice on the runway and experienced a loss of directional control. The aircraft departed the runway and hit a snow bank, coming to rest inverted. The aircraft sustained substantial damage. No injuries. 13.02.2013*/US/ FL/ New Smyrna - A Cessna T337C Super Skymaster plane (N2576S) crashed shortly after takeoff killing the pilot. */US/ NE/ Grand Island/ Central Nebraska Regional Airport (KGRI) - A Piper PA46-500TP Meridian plane (N33CA) strruck the front of the Trego Dugan terminal at KGRI while taxiing due to the brakes failure. The aircraft was damaged. No injuries. */New Zealand/ South Island/ St Arnaud/ near Lake Station airstrip (NZLE) - A single-seater sailplane encountered wind gusts at tow release and landed short of the airstrip at NZLE. The 47-year-old pilot is reported to have suffered spinal injuries, and was flown to Nelson Hospital for treatment. South Airlines Antonov 24 passenger plane (UR-WRA) was involved in an accident near Donetsk, Ukraine. There were 52 occupants on board. Five people were killed, 12 were injured. The airplane operated on a charter flight 8971 from Odessa (ODS) to Donetsk (DOK), carrying football fans on their way to a match of Shakhtar Donetsk against Borussia Dortmund. 14.02.2013*/Syria/ Idlib - Syrian Air Force Su-22M jet shot down by rebels. The pilot died. */Switzerland/ Buttwil Airfield (LSZU) - A training Cessna-152 plane (HB-CFF) went into a snow bank and flipped over on landing. No injuries. */Colombia/ Caldono - A military Bell 206B JetRanger III helicopter (HK-2887) made hard landing injuring the 4 occupants. */US/ TX/ NE of Abilene/ near Hamby - A Beechcraft A60 Duke plane (N7466D) ran out of fuel and made an emergency landing, but crashed into trees. */Argentina/ Santiago del Estero - A military Lockheed Martin OA-4AR Fightinghawk plane (C-902) crashed on landing. Both pilots ejected safely. 15.02.2013*/Kazakhstan/ Almaty region/ Bakanas - A Bell 206L3 helicopter had to perform an emergency landing, but came down and landed on its side. No injuries. */Germany/ Brandenburg/ Schonefeld/ Berlin-Schonefeld Airpot (EDDB) - An Embraer EMB-500 Phenom 100 plane (OO-MAS) experienced a runway excursion after landing, damaged. 16.02.2013*/US/ IL/ Morris/ near Morris Municipal Airport (C09) - A Bellanca 17-30A Viking plane (N93747) experienced a loss of engine power while on approach and force landed on a road, hit a pole and came to rest in a field. No injuries. */US/ AK/ Unalaska/ Unalaska Airport (PADU) - A Piper PA-31-350 Chieftain plane (N15PR) collapsed a gear on landing. No injuries. */Australia/ NSW/ Hunter Region/ NE of Maitland - A light aircraft was practising landings and take-offs when it crashed into some trees. Both occupants received minor injuries. 17.02.2013*/Australia/ VIC/ Trida - An agricultural helicopter struck power lines and crashed. No injuries. */US/ WI/ Elcho - A Cessna 177 Cardinal plane (N30227) force landed in a field, damaged. One of the 2 occupants received minor injuries. */US/ AK/ northwest of Anchorage - A Cessna 170B airplane crashed in windy weather injuring the 2 men on board. */US/ MS/ Poplarville - An ultralight plane clipped a pine tree and crashed killing the pilot. 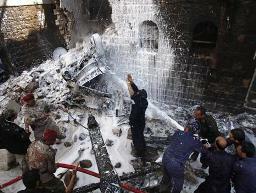 A Yemeni air force plane crashed in the capital Sanaa on Tuesday, killing at least 12 people, security sources said. Three women and two children were among those killed when the Su-22 plane, on a training flight, came down in a western residential district. Eleven people were wounded, security sources said. Several cars were on fire and debris littered the street. A security official said the pilot had ejected from the plane. There was no immediate word on whether he had survived. The police and medics evacuated five completely burned bodies, they were all unrecognizable. People were terrified and ambulances arrived late. 21.02.2013*/US/ GA/ Thomson-McDuffie County Airport - A Raytheon 390 Premier IA plane (N777VG) crashed in a wooded area near the airport killing 5 and injuring seriously 2 occupants on board. 22.02.2013*/US/ OR/ NW of Lebanon/ near Tallman Airport (88OR) - A Luscombe 8A Silvaire plane (N1192K) experienced crosswinds shortly after takeoff, clipped trees and force landed to a field, sustaining substantial damage. No injuries. */US/ FL/ near the Bayside Bridge in Clearwater - Piper PA-28-180 Cherokee C plane (N4789L) crashed into the water on approach injuring slightly the pilot. */US/ OK/ Oklahoma City - An Eurocopter AS 350B2 Ecureuil medical helicopter crash-landed outside an Oklahoma City nursing home early Friday, killing 2 people onboard and injuring a third who was pulled from the burning wreckage. One person on the ground suffered minor injuries and was treated at the scene. 24.02.2013*/Colombia/ Catatumbo region - An army helicopter crashed injuring the 7 occupants. */Colombia/ Vistahermosa - An army Sikorsky UH-60L Black Hawk helicopter (EJC-2154) had been engaged in an air assault against FARC guerrillas, but caught fire and made an emergency landing in the combat zone. Then it exploded, probably for having struck a mine. The 4 occupants were killed. */Mexico/ Cozumel-Cap. Eduardo Toledo Airport - A Piper PA-28-140 Cherokee Cruiser (N44418) crashed on approach into trees. */US/ FL/ Key Largo/ Biscayne Bay - A Cessna T337G Pressurized Skymaster plane (N8594M) experienced a loss of power and force landed in the shallow waters of Biscayne Bay. The 4 occupants received minor injuries. */Greece/ Trikala Prison Institute - An Eurocopter AS 355N Ecureuil 2 (SX-HJV) brought down during an illegal attempt to take a prisoner out of Trikala jail. Three people were injured. */South Africa/ Gauteng/ near Bapsfontein - A Cessna T210N Turbo Centurion II plane (9J-MOO) made a belly landing. No injuries. 25.02.2013*/Peru/ Pisco/ San Clemente district/ Hills of Centro Poblado Camacho - A military Schweizer 300C helicopter (FAP-667) crashed injuring the 2 occupants. */US/ ND/ McLean County/ S from Parshall - A 91st Missile Wing UH-1N Huey helicopter made an emrgency landing injuring slightly 2 crew members. 26.02.2013*/Russia/ Kazan International Airport - Volga-Dnepr Airlines Antonov 124 cargo plane (RA-82042) was taxiing when it struck with the left hand wing tip the top of fuselage of a parked Yakovlev 42 plane (RA-42555) belonging to Tulpar Air.and damaged it seriously. 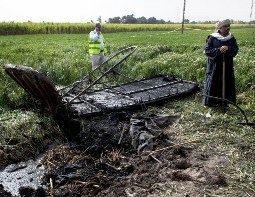 An Egyptian inspector of the Civil Aviation Authority, left, works at the site of the balloon accident at Luxor, Egypt. 27.02.2013*/Australia/ VIC/ Cape Clear - A ICP Savannah VG light plane (19-7824) clipped power lines and crashed injuring both occupants. */US/ NC/ Stanford-Lee County Regional Airport (KTTA) - A Piper PA-32-300 Cherokee Six plane (N1953H) crash-landed in a field on approach. No injuries. */Chile/ Futrono - An Avid Aircraft Amphibian plane (CC-PRI) flipped over during landing in a lake. The pilot received minor injuries. 28.02.2013*/Egypt/ Hurghada/ Hurghada International Airport (HEGN) - Ural Airlines Airbus A321-200 (VQ-BOC) experienced a tail strike following a bounced landing and go-around. The aircraft sustained substantial damage. No injuries.